Registration Open for 6th Annual Teddy Bear 5K & 1K Walk/Run! Registration is currently open for runners and walkers of all ages for the 6th AnnualTeddy Bear 5K & 1K Walk/Run?on Sunday, September 23, 2018. The race that awards all participants a pint-size teddy bear when they cross the finish line this year moves to the morning with the 5K starting at 8 a.m. and the 1K starting at 9:15 a.m. Note that children under 12 must be accompanied by a registered adult in either the 1K or the 5K. The 5K also includes a stroller division. The 5K course takes runners through the shaded Pimmit Hills neighborhood, west of Falls Church City. 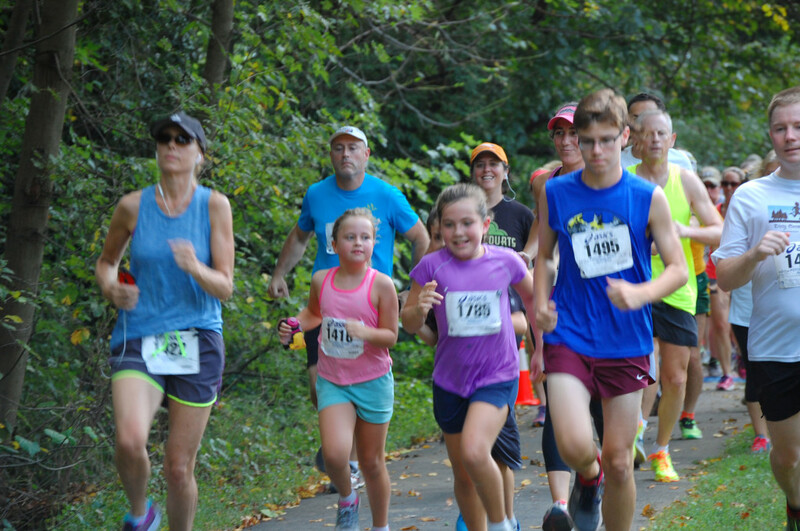 Runners are urged to check in at the registration booth behind the Falls Church-McLean Children’s Center at 7230 Idylwood Road and participate in the Teddy Bear parade at 7:45 pm to the 5K Start/Finish Line in Pimmit Hills Park, between Arch Drive and Griffith Road. 5K runners, boys and girls in 6 age groups for children, from ages 6 to 18, and males and females in 7 age groups for adults, will be eligible for prizes from local businesses, including gift certificates to: Panjshir Restaurant and Hilton Garden Inn of Falls Church; The Greek Taverna, Assaggi Osteria, Cafe Oggi, and Kazan Restaurant of McLean. For kids: A shopping spree at Doodlehopper Toy Store, a Soccer Party with Golden Boot, and more. Proceeds of the event support Falls Church-McLean Children’s Center, a high-quality, nonprofit preschool dedicated to giving young children from low- and moderate-income, working families the strong start they need to be ready for success in school and in life. Several local individuals and businesses are generously sponsoring the event including Ric and Jean Edelman, Anne Kanter, State Farm Insurance Agent Lynn Heinrichs, VA Delegate Marcus Simon, Hyphen Group, Chain Bridge Bank, Net E, Senior Housing Analytics, Susan and Donald Poretz, Powell Piper Radomsky, Berman & Lee Orthodontics, Lewinsville Presbyterian Church, Drs. Love and Miller, Digital Office Products, and VA 529. Sponsorships are still available by calling 703/534-4907 before August 30 to have logos printed on runner t-shirts. Founded in 1969, Falls Church-McLean Children’s Center is celebrating its 50th year of providing an affordable, comprehensive, full-time early childhood education program designed to give all children, regardless of their family’s financial resources, a strong foundation on which to build the rest of their lives. For inquiries about openings this fall, call 703/534-4907. Recognize a familiar face in this week’s Washington Post Magazine? The Catalogue’s founder, Barbara Harman, was recently interviewed for Joe Heim’s weekly Q&A column, “Just Asking.” In 2003, Barbara — with the support of the Harman Family Foundation — created the Catalogue for Philanthropy to shine a light on our region’s best community-based nonprofits. As we begin producing our 14th Catalogue, we’re grateful to Barbara for her vision and leadership, which has helped raised more than $32 million for local charities. You can learn more about the Catalogue’s history here, and sign up to receive your complimentary copy here! Below is the interview in full, which can also be viewed on the Washington Post’s website. 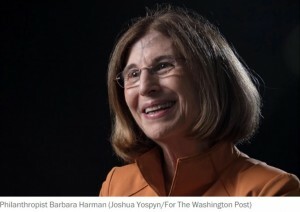 Barbara Harman, 69, is the founder and president of the Catalogue for Philanthropy: Greater Washington and is executive director of the Harman Family Foundation. She splits her time between Washington and Boston. The Catalogue for Philanthropy is really essential in helping people find lesser-known, worthy local organizations that need money. But it’s not the most exciting name. Yeah, I’ve kind of heard that from people. Have you got a better idea? How about Fork It Over? I love it. I think the name is a little stuffy. But when something catches on, as the Catalogue seems to have caught on here, it’s hard to let go of the name. But I have to say it’s something we’re thinking about. I can ask readers to submit suggestions. Is there one gift you’ve been able to make that stands out to you? It’s a hard question. I can think of so many extraordinary charities doing amazing work here on education, on youth arts, on homelessness. I guess the thing that has struck me the most with all of the organizations that I give to is what a radical difference there is between the lives that most of us lead and the lives of some of the other people who live in this city, whose neighborhoods and whose circumstances really are unimaginable to most of us. I’ve been in communities where the average annual income is $9,100 a year. And then you see the work that these small nonprofits are doing to make these kids’ lives better, and it’s really a pretty extraordinary experience. Your father was Sidney Harman, and he was a huge contributor to the Shakespeare Theatre Company and many other causes. Did your parents create a family culture that emphasized giving? Absolutely. It was very much a part of my growing up. It was very clear to all of us that it was his sense, and should be our sense, that a family in a position to give should be a giving family. What percentage of my income should I be donating in order to feel like a good human being? I think it’s a really personal choice. I’m sure you’ve heard about the giving pledge. This is a pledge that Warren Buffett and others have signed where they are giving away the vast majority of their income. Warren and I are in slightly different tax brackets. Yeah, same here. Some people think tithing is the right way to approach this: 10 percent of your income. I don’t think that a lot of people give 10 percent of their income, and I guess I don’t really think there is a number. I think what’s important is to find the things that really resonate for you. Then I think the giving grows over time, and it becomes a different kind of engagement than just writing a check. The Catalogue also received coverage in Washington Life Magazine’s June issue! 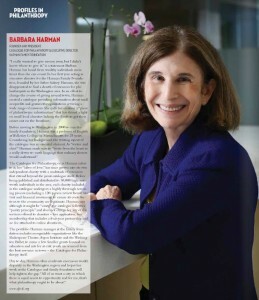 The article focused on individuals in the community working for the greater good – and our very own Barbara Harman was one of the profiles in the issue (profile text shown in full below). To see the issue, view the Washington Life digital edition. “I really wanted to give money away, but I didn’t know where to give it,” is a statement Barbara Harman has heard from wealthy individuals more times that she can count. In her first year acting as executive director for the Harman Family Foundation, founded by her father Sidney Harman, she was disappointed to find a dearth of resources for philanthropists in the Washington area. In an effort to change the course of giving around town, Harman created a catalogue providing information about small nonprofits and grassroots organizations covering a wide range of missions. She calls her creation a “piece of philanthropic infrastructure” that has shined a light on small local charities lacking the funds to get their causes out on the frontlines. Before moving to Washington in 2000 to run a family foundation, Harman was a professor for Wellesley College in Massachusetts for 25 years. Considering her background, the writing aspect of the catalogue was an essential element. As “writer and chief” Harman made sure to write from the heart in a really down-to-earth language that ordinary donors would understand. The Catalogue for Philanthropy, or as Harman refers to it, her “labor of love,” has since grown into its own independent charity with a multitude of resources that extend beyond the print catalogue itself. 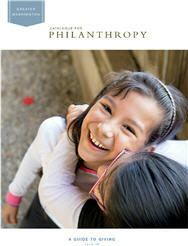 Before being published and distributed to 30,000 high net-worth individuals in the area, each charity included in the catalogue undergoes a highly thorough screening process (including a 120-person review board, site visit and financial assessment) to ensure its contributions to the community are legitimate. Harman says although it might be “crazy,” the catalogue follows a “purity principle” and does not charge for any of the services offered to charities — free application, free membership that includes a four-year partnership and no fee attached to online donations. The portfolio Harman manages at the family foundation includes recognizable organizations like the Shakespeare Theatre, Aspen Institute, and the Washington Ballet, to name a few. Smaller grants focused on education and arts for at-risk youth are sources from the best resource in town — the Catalogue for Philanthropy itself. 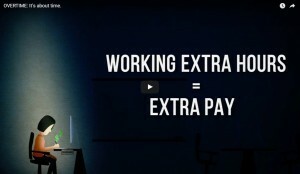 ​New DOL Overtime Rules? Don’t Panic! Want more information? Check out this informative blog from one of our partners, Raffa. Last week the region watched — and waited — to see how the news of WMATA’s Metro shutdown would affect daily commutes. With more than 700,000 daily riders on metro trains, most riders who were unable to telework were left to take to the roads by bus or by car. But for one local organization, the shutdown was an opportunity to bring attention to another commuting alternative: bicycling! 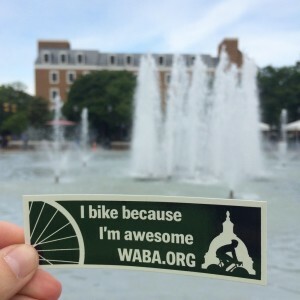 Following last week’s announcement, Washington Area Bicyclist Association and its supporters sprang into action, encouraging commuters to give biking a try through guided bike pools across the region (#WMATAbikepool), distributing maps and tips on their blog, and meeting riders on local trails. We caught up with Colin Browne, Communications Coordinator at WABA, to learn how they organized efforts so quickly following the news of the shutdown, and how they plan to carry this momentum forward through 2016 and beyond. How did the concept for #WMATAbikepool start? Colin: In the WABA office, as soon as we heard about the Metro shutdown, we knew it was going to be a big day for bike commuters, and more specifically, a big day for people to feel good about biking to work. We wanted to harness that enthusiasm before it just curdled into traffic schadenfreude. I put together a quick blog post and some social media posts that I hoped would set a welcoming tone for the conversation (especially on Twitter, which can drift into cynicism very quickly) and encourage folks to reach out to their coworkers and neighbors. The idea for the #WMATAbikepool hashtag came from a member of our Women & Bicycles Facebook group named Anita Kinney, who used it and suggested that others do the same. I think the hashtag worked because it was a grassroots idea that WABA was able to amplify. These sorts of campaigns, even when they happen very quickly, feel so much more organic when an organization can say “look at this cool thing that people are doing” rather than “You should use this hashtag.” It really provides an opportunity for people to feel good about the community that they’re a part of, instead of just having a logo and acronym telling them what to do. Do you have a favorite “rider moment” from the day? Colin: We set up a table to give away coffee and granola bars on the Met Branch Trail in Eckington. I showed up with my camera, planning to take a few photos of a busy trail and then head back to the office. I ended up staying for three and half hours and only took a dozen pictures because there were so many happy people to talk to. Data from DDOT said that biking on the trail was up 65%, and we gave away three times as much coffee as we normally do at our trailside coffee events. My favorite rider moment was chatting with a woman who’d stopped for some coffee and was commuting on her bike for the first time. She had ridden twelve miles in from her home in Forest Glen on the Sligo Creek Trail. It was the longest ride she’d ever done, and she was beaming! She said she was already excited for the ride home. Were there any big takeaways/key lessons that WABA learned on this day? Colin: The experience really drove home how important it is to be able to not just react, but engage quickly with an opportunity like this. This could easily have been a situation where we pushed out some some generic, one-way content about biking to work and left it at that. Instead we had an authentic community moment that really let people feel how powerful their own energy and enthusiasm is. What big projects is WABA currently working on? Colin: We just finished off a yearlong strategic planning process and published a 5 year strategic plan. Out topline goals are to triple the number of people who ride bikes in the region by 2020, and ensuring that, by 2035, every resident in the region (we work in DC, Prince George’s County, Montgomery County, Arlington, Alexandria, and Fairfax County) lives within 1 mile of a protected place to ride a bike. To find out how you can get involved with WABA, visit waba.org. February 4th marks World Cancer Day, a day that unites the world’s population in the fight against cancer. This day aims to save millions of preventable deaths each year by raising awareness and education about the disease, pressing governments and individuals across the world to take action. Breast Care for Washington (Washington, DC) offers breast cancer screening and support for underinsured women. Hope for Henry Foundation (Washington, DC) improves the everyday lives of kids in DC who are fighting cancer. Nueva Vida (Alexandria, VA) offers support services for Latinas affected by cancer. Smith Center for Healing and the Arts (Washington, DC) offers an integrative approach to wellness and cancer treatment by addressing the whole person. Tracy’s Kids (Bethesda, MD) addresses the emotional needs of children with cancer through art therapy. Host a birthday party for a hospitalized child at Hope for Henry. Provide art supplies for 1 teen art group at Tracy’s Kids. Host an artist-in-residence at a local hospital with Smith Center for Healing and the Arts. Cover the cost of a 3D mammogram for 1 uninsured patient through Breast Care for Washington. Buy 10 metro cards for transportation to medical and therapy appointments through Nueva Vida. And of course, when using the Catalogue for Philanthropy to?#givelikealocal, you can give with confidence knowing at each of our charities has been rigorously vetted for excellence! Congratulations to Sitar Arts Center! Congratulations to Sitar Arts Center, who was just named the recipient of The Washington Post 2015 Award for Excellence in Nonprofit Management! This prestigious award is a program of the Center for Nonprofit Advancement, sponsored by The Washington Post, which recognizes top nonprofit organizations in the Washington, D.C. metro area that exemplify outstanding achievement and organizational management determined through a competitive application process and panel review. Congratulations are also in order for two finalists, Arlington Street People’s Assistance Network (A-SPAN) and Calvary Women’s Services, which also happen to be members of the Catalogue for Philanthropy! When it comes to daily spending habits, what has you reaching for your wallet most often? Coffee? Parking? Lunch? In Sunday’s New York viagra 100mg Times, . Using a national survey of consumer spending conducted by the Bureau of Labor Statistics as the basis for her analysis, the author finds that people in different metropolitan areas buy significantly different items (the average household in the nation spends approximately $5,000 per year on conspicuous items). In Washington D.C., for example, we spend significantly more than the national average on elder care, and men’s clothing (suits, footwear, underwear), yet are on par with the rest of the country when it comes to charitable giving. This week Washington DC is host to its first annual Millennial Week. With a focus on highlighting the impact of the largest, most diverse generation in the United States (approximately 92 million in the United States, 1.8 billion globally) Millennial Week DC looks to cultivate, promote and present meaningful ideas and trends that reflect this generation. In Thursday’s Washington Post, Caitlin Gibson explores Millennial Week DC, the negative stereotypes normally associated with this generation, and the steps they are taking to overcome them. While many label this generation as entitled, selfish, or uncharitable, the truth is that millennials are significant givers, of both time AND money. A recent study from Blackbaud shows that more than 60 percent of millennials donated an average of $481 per year across 3.3 charities. This generation, unlike others, wants more from the groups to which they give. They want to feel like they are part of the solution, whether as donors, volunteers or brand ambassadors. As nonprofits, we must be ready to engage them in these ways. At the Catalogue for Philanthropy, we’re inspired by millennials and the way that they approach charitable giving and volunteerism. They challenge us to think bigger, be bolder, and meet their rising expectations for real-time information, rewards, and results (expectations which have been set largely thanks to the ever-present and emerging digital landscape). During 2014-2015, a main goal for the Catalogue is to expand our involvement with millennials, and we have exciting events, partnerships and campaigns in the works to do this…stay tuned! Are you a millennial who wants to get more involved with the Catalogue? We’d love to hear your ideas! Contact us at ideas@cfp-dc.org. Last week, The Chronicle of Philanthropy tackled the difficult subject of nonprofit mismanagement with “Keeping Quiet About Wrongdoing at Nonprofits Only Makes Matters Worse” by Ken Berger, president of Charity Navigator and Jeremy Kohomban, chief executive of the Children’s Village. The article discusses how nonprofits tend to ignore media coverage of the wrongdoing and mismanagement that happens in the sector, and instead choose to believe that the end result — their good work in the community — will help the public overlook the problems that exist. Berger and Kohomban argue that nonprofits should not bury their heads in the sand, nor focus only on results, as this creates “a sense of denial and defensiveness throughout the nonprofit world that is damaging our credibility with the public.” They call for nonprofit leaders and board members to hold each other accountable and speak out when they see mismanagement happening. At the Catalogue, we agree with the authors that there is much more to assessing how a charity operates than simply evaluating its results. Our review process encompasses the things Berger and Kohomban mention as being critical to evaluation: financial management, good governance, ethics, and high operating standards. We hope that with increased?accountability, our review process, and the processes being implemented by nonprofit leaders such as Berger and Kohomban, we can continue to elevate perceptions of the nonprofit sector. New momentum has been growing to create activist organizations that defend nonprofits from public attacks and from regulations and laws they believe would harm their operations. Witness the efforts of CForward, an organization that seeks to influence local and state politicians and went so far as to organize a PAC; and the Charity Defense Council, an effort to thwart unfair criticism. Both groups are trying to give nonprofits more political muscle, and both are responding to the sensationalist news media, which more and more recognize that controversy sells and often present information about charities that lacks context, and in some egregious cases intentionally distort information. The result has been that prominent journalists have depicted some well- functioning charities as incompetent or deceitful, and sometimes both. To the extent that these efforts defend nonprofits that need defending and educate the public on the complexities and challenges facing the nonprofit world, we say bravo. But we fear that too often, allegations of true mismanagement and scandal at nonprofits either get no response from charity and foundation leaders or, even worse, get a defense that cannot be justified. Cases of mismanagement abound. Some researchers have estimated that tens of billions a year are lost as a result of unethical behavior, typically by leaders of nonprofits. For example, last month William Rapfogel pleaded guilty to stealing more than $9-million from the Metropolitan Council on Jewish Poverty, an organization he led for more than 20 years. Mr. Rapfogel said he had been involved in a complex scheme with other top executives in which they systematically overpaid the council?s insurance and then obtained kickbacks from the insurance company. One can’t pretend the news media sensationalize nonprofit corruption when it comes to such cases. In our opinion, based on our 60 years of collective experience, a culture of constructive self-criticism has yet to embed itself in the ethos of most nonprofits, their staff leadership, and their boards of directors. The reasons for these poor responses are varied. Nonprofits, like other organizations, often follow a commonly held view about the best way to handle an attack: If you ignore it, the public will forget and move on. The media thrive on controversy, so don’t discuss it and don’t highlight it in any way and journalists will move on. But many nonprofits also think that because they are doing important work that serves society, the public should focus on the end result and little else. What?s more, many nonprofit leaders believe it’s unnecessary to speak out because bad deeds are so rare at charities. Just like in business or government, wrongdoers exist, but nonprofits don’t see any reason why they should be held to a higher standard than any other institution when it comes to punishing bad players. The result is a sense of denial and defensiveness throughout the nonprofit world that is damaging our credibility with the public. We recognize the deep commitment of people who work at nonprofits and the great good they do for society. But we strongly disagree with those who believe “results are all that matters” when assessing how a charity operates. Financial management, good governance, ethics, and high operating standards must continue to be vital measures of a nonprofit’s worthiness. If a charity mismanages its finances, today’s results can be tomorrow’s bankruptcy. If a charity has poor governance, an unethical and unaccountable chief executive or board might embezzle funds that won’t go toward producing results. And if we persist in saying results are all we care about, we will continue to see a never-ending series of scandals and mismanagement that will rock the nonprofit world and damage the public trust. We need to look at both performance and accountability for financial, operational, and results to assess nonprofits. Charities should also be held to a higher standard of ethics because of the way we are structured and how we raise money. We benefit from tax exemptions and the charitable deduction, and we are governed by volunteers. The public expects independent oversight of our organizations to ensure that tax-exempt money benefits society as a whole and not an institution or its leadership. No nonprofit should tolerate serious ethical failures, and we must all be outspoken when somebody violates our trust. We therefore urge nonprofit leaders and boards of directors to step up and take the risk of confessing to abuses of funds and other serious misdeeds. This is not easy for anyone to do. We know that those who speak out could face ostracism from movers and shakers in the nonprofit world as well as from donors and powerful political leaders. Personally, neither of us has always been so bold. We have failed to speak when we should have. We have both missed opportunities in our careers. Just last year during a scandal in New York City, Jeremy raised the need for a public statement from a well-regarded nonprofit membership association on whose board he and the alleged perpetrator served. The refusal was almost instantaneous. In this case, the excuse was that this happens, and because of the powerful parties (allegedly including politicians) involved, it was best to say nothing. Rather than pushing for further discussion, and an open discussion, Jeremy simply backed off because he feared alienation. A few years back, Ken was a firsthand witness to a CEO who had been stealing large sums from a charity. Although the CEO was eventually caught and removed as a result of a reporting system Ken helped create, the length of time the theft went on should never have been tolerated. Ken’s fear (and that of others within the organization) of retribution for reporting the problem permitted the situation to go on far too long. For some time now we both have been committed to being more forthright about our errors and missteps, as well as speaking out when we see scandalous and unethical behavior. However, it will take this generation of nonprofit leaders, and likely the ones who follow us, to breed the type of culture that celebrates open discussion of these things. The nonprofit world has already lost enough time and credibility. Now is the time to start doing better. Ken Berger is president of Charity Navigator and Jeremy Kohomban is chief executive of the Children’s Village, in Dobbs Ferry, N.Y.
A big Catalogue “cheers!” to Dance Place, one of our 2012-2013 charities, on the exciting renovation to its Brookland space and accompanying coverage in today’s Washington Post (article below). Dance Place serves as a bustling dance school and neighborhood cultural center, offering performances and training in various types of dance, while also offering academic enrichment and dance classes, job training for teenagers, and a summer arts camp for at-risk youngsters. Interested in supporting Dance Place through a donation or volunteer work? For $150, you can sponsor a student for a 10-week scholarship to attend after-school dance classes; $500: 1 InReach performance for a local school; $1500: 1 full scholarship to Dance Place summer camp. Dance Place is always looking for volunteers to serve as ushers for its weekend performances. No training necessary, see a great performance for free! Check out their nonprofit page for more details. “Once a dancer always a dancer. That’s what I thought as Carla Perlo showed me around her domain. In 1980, the Washington area native founded Dance Place, a center for contemporary dance whose original home was in Adams Morgan. Forced from the building in 1986, Carla came to Brookland, where she turned a former welding company warehouse on Eighth Street NE into a performance space. That building is in the midst of a $4 million renovation. When it’s done this summer, it will reestablish Dance Place as an artsy anchor in a rapidly changing corner of the neighborhood. Carla is a leader, and I mean that quite literally: She took me by the elbow as we crossed the street, guided me onto the sidewalk, brought me to a halt whenever she wanted to stop and point something out. I was reminded of the ballroom dancing lessons I took with My Lovely Wife. As is common, students would swap partners you have to be able to foxtrot or samba with anyone and my wife would be amazed by her time with the male instructor. A good partner can take the clumsiest dancer and ?through his carriage, through the firm pressure of his hands turn her into Ginger Rogers. I was Ginger. Carla was Fred. If I’d been born a boy, I’d probably have been an athlete, she said. I was a girl, so I became a dancer. Her parents were Edith and Hyman Perlo. Hyman was a standout athlete at Roosevelt High in the District and an all-Met basketball player. He served during World War II as an Army paratrooper. The Perlos ran a clothing shop in Washington before Hyman went to work for Abe Pollin as director of community relations for the Baltimore Bullets, today’s Washington Wizards, and the Capital Centre. Carla, 62, is a bit of community relations director herself. When we moved here, this was nothing, she said as we walked on Eighth Street. The neighborhood could be dangerous at night back then. The kids protected me, Carla said. They were no doubt curious about this crazy woman who had set up shop along an industrial strip by the railroad tracks. Soon they were knocking on the door, asking to take classes, Carla said. That effort continues today. Kids can study African dance, hip-hop, tumbling, tap and more. Adults come to move their feet, too. Local troupes book performance time at Dance Place, which also hosts touring companies from around the world. Eighth Street has changed a lot in the past 28 years heck, in the past 10 years. Next door to Dance Place is ArtSpace, an apartment building with studio and gallery space for artists and some nice, big wooden floors for dancers. On the other side of Lee?s auto body shop is a place that handles bodies of a different sort: Excel Pilates. Dance Place has some temporary space in the Edgewood Arts Center, a multi-use space. It sits next to the Monroe Street Bridge, which has been yarn-bombed by fiber artists, some of whom have studios in the Monroe Street Market, the big red-brick buildings overlooking the Brookland-CUA Metro station. A brewpub, Brookland Pint, will open soon. A Barnes and Noble is coming. When the weather warms up (it will warm up, won’t it? ), Art on 8th will start: dance, music and art Thursday through Saturday on a plaza. Carla hopes the Dance Place construction will be finished by June, in time for the annual Dance Africa festival. The renovation will greatly improve things. There will be better tech booths for light and sound and more comfortable seating for the 144 audience members. The dancers are most excited that they’ll be able to get from one side of the theater to the other without having to scurry outside the building. I had stopped by Dance Place to hear about what may be the most visible feature of the renovated building: Artist Christopher Janneuy is creating a light and sound installation that will soar from an outside corner of Dance Place. Called Touch My Building, it is a two-story tower of translucent glass that will make sounds when passersby touch it. Won’t that be noisy, I asked. The sound is quiet enough that it won’t be intrusive, Carla said. The light will be more like stained glass than neon. A soft light from within.